Biblical plague on its way? One of the intriguing things about the natural world is its utter unpredictability. Who would have dreamed that this insect would have turned up near Achmelvich Bridge (NC0824) on 24th August, where it was photographed by Jane Tulloch and brought to our notice by Roz Summers. What is it? 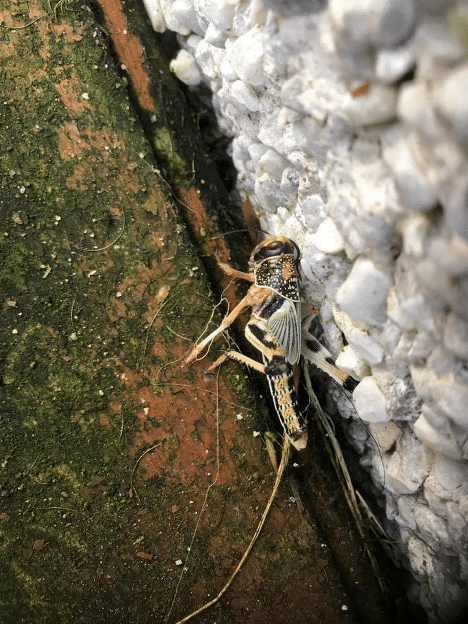 Obviously some kind of grasshopper, but, at about 5cm, considerably larger than any species native to Scotland, and, from the length of its wings, still an immature individual. A quick consultation with our friendly insect expert, Stephen Moran, elicited the opinion ‘looks like a nymph of the solitary phase of Locusta migratoria to me…or a very closely related species’ (NB on 28-11-17 Murdo Macdonald of the Highland Biological Recording Group suggested this may be Schistocerca gregaria, the Desert Locust). A very handsome insect, greatly outweighing either of our two local grasshoppers, which, incidentally, have been very thin on the ground this summer. The next question is how did it reach Achmelvich? I seem to recall that migratory locusts are bred as laboratory animals and also as food for insectivorous pets, perhaps even, nowadays, for human consumption? So who, accidentally or otherwise, brought this one across the Assynt border and are there more lurking locally? That is hopefully unlikely, so the answer to the question in the title is probably not.